Ixion's Technical Director Phil Badger has returned from China, having travelled there to oversee the production run of the 7mm scale Fowler 0-4-0DM. This loco is due to arrive from the mainland factory at the Hong Kong shipping point on Wednesday October 30. All being well with the airfreighting and customs, the loco will be in Ixion's hands in both the UK and Australia in mid-November, and in-store with our stockists by the end of that month. 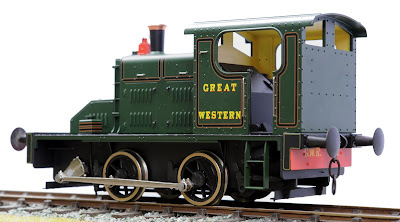 The loco is supplied in fully lined and lettered GWR green, and plain unlined GWR green. We have made 500 of each variation. Fully one-fifth of the production run has already been pre-ordered in the UK, so don't delay in getting your order in. This is especially important for Australian customers, as we are only importing 50 models; 20 GWR and 30 plain green. As always, Ixion gives you more for your money, and this loco is supplied with a range of etched brass Fowler maker's plates and suitable name plates. Also included is a brand-new set of injection moulded diesel loco tools - dummy oil and electric lamps, spanners, wrenches, hammers etc. Photos of these items will be posted soon, when I return from being away from home on business.